The world of documentary filmmaking has been treated to some truly talented directors including Morgan Spurlock (Super Size Me), Rachel Grady and Heidi Ewing (Jesus Camp), Eugene Jarecki (Why We Fight), Alex Gibney (Enron: The Smartest Guys in the Room) and Seth Gordon (The King of Kong). In case you didn't know, all those different filmmakers are combining into a Captain-Planet-worthy assembly of documentarians. 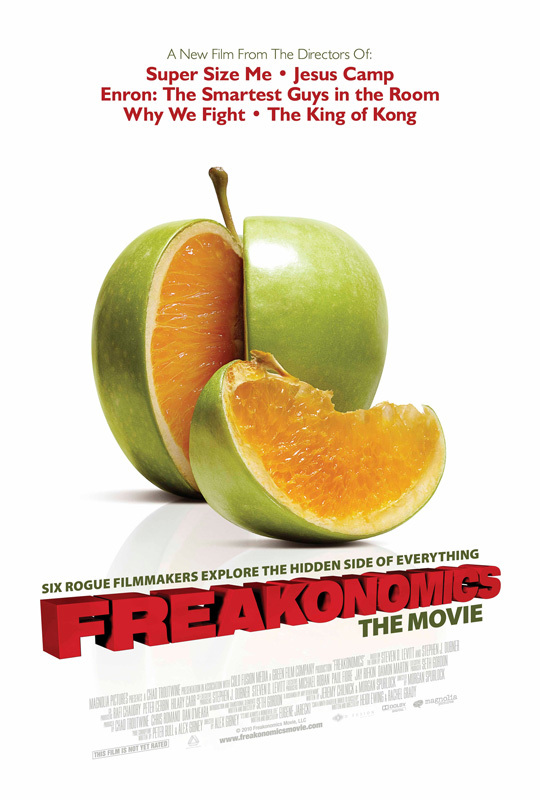 Each director has helmed different segments for Freakonomics, and the first poster for the doc (via Cinematical), which isn't much of a departure from the book cover, has just debuted online. We don't have a trailer for this yet, but expect to see one soon. Freakonomics already played at the Tribeca Film Festival earlier this year receiving mixed reviews. We'll let you know when there's more to see for this! Freakonomics is an adaptation of the non-fiction book of the same name which combines pop culture and economics for educational and entertaining results. Economist Steven Levitt and New York Times journalist Stephen J. Dubner penned the book which makes even the most mundane subjects seem wholly interesting. Jarecki focuses on explaining a drop in crime rates throughout the early 90's, while Spurlock looks at the socioeconomic patterns and repercussions of baby names. Meanwhile, Grady & Ewing look at results from underachieving students receiving cash to excel in their studies and Gibney dives into the shady dealings in the world of Sumo wrestling. Gordon directs the segments that link all these different slices of life together. Sounds like a hell of a documentary to check out when it's available OnDemand next month or in theaters on October 1st from Magnolia Pictures. A quieter unveiling, but I'm sure a few of you still want to see this doc. This sounds epic, I'm surprised it hasn't gotten more press. This is the first time I've ever heard of it. the content of freakonomics (the book itself) has long been superseded by new information,anyone who reads the book for the first time would be wowed by the gimmick,drug peddlers don't earn much etc,its like an exciting expose,but the substance and basis of it all (at least to any academic) doesn't amount to much. ha oh #3 you make me laugh! It was a pretty good book, true or not. Perfect documentary material. That peice of fruit looks delicious.